One of the benefits of sabbatical is the opportunity to challenge oneself to do something outside one’s comfort zone. About a month ago, I was talking to someone about my time away from scheduled work, and she asked me if I wanted to present a piece of poetry or prose at an event in May. I gulped hard and told her I’d see what I could come up with (or rather, “up with what I could come”). The story below is the result of my efforts on that front. And this weekly blog is another. My “assignment,” such as it was, was a piece about the coming of spring, and its goddess, Persephone. So without further ado, here is my short story, “Persephone.” Please let me know what you think in the comments. 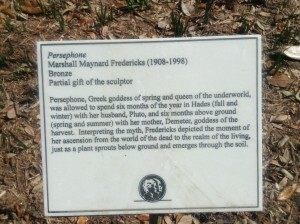 Statue of Persephone, goddess of spring. Also known as Kore. Corey disappeared. Not like magic, but one moment she was here, the next she was gone. The last of the leaves were hanging on the oaks, and she took off on a motorcycle with someone who appeared at her mother’s annual barn dance. I don’t know if it was her idea or his, but they took off and went underground. And when she left, she seemed to take every last ray of light, of hope, of warmth with her. After she left, the days, so short in light but so long in their tediousness, were indistinguishable one from another. The sky was gray, the trees were little more than skeletons that left the tumors of squirrels’ nests exposed. At least in summer their modesty is protected by leaves. The only respite from the constant dreariness was on days when it’s so cold even clouds take shelter leaving a brilliant blue sky. It’s a blue that belies its danger, and is so far from the warmth of the days Corey and I shared last summer. One such day last June, we were walking in a county park outside of town. The blue sky that since she left has been so brittle, on that day was the perfect foil for the newly-burst green of the trees, the impressionist palette of the wildflowers, and the sparkle of the stream that made a mockery of its banks along our path. As we came around a bend, there was a patch of brilliant orange flowers standing tall in the sun. Corey said they were Devil’s Paintbrush, but they may as well have been orange dandelions as far as I knew. She was captivated by their radiance, their rilled-edged petals, and their spiny stems. They caught the sunlight like nothing else around them and drew her in with their color. As she bent down to examine one of the flowers, I looked up and saw a field full of the same shimmering orange like the scene in the Wizard of Oz when Dorothy and the others emerge from the forest to find the field of poppies. I noticed that part of the brilliance of the color was the hundreds, thousands of bumblebees browsing through the field and checking out each flower. The entire field was dancing to a tune that was just beyond human hearing. I looked over at Corey. She was so calm, like she had found the secret to existence, and the smile that spread across her face brightened the air around her. When I looked back at the field, the dance of the bees had stopped. Somehow, they had all taken the same moment of my distraction to return to their hives in an instant. Then I felt it. A sub-sonic rumbling under my feet, growing in intensity. The vibrations grew stronger until they became sound, then grew louder as whatever it was approached. An ATV burst through a thicket, crashing and crushing everything around it. The rider wore a flaming helmet and a jacket of blaze orange that flapped behind him as he rode. He aimed his machine right between Corey and me, practically knocking me off my feet, and certainly snapping Corey out of her reverie. He tore off into the field of flowers zig-zagging his way so he would leave the greatest amount of devastation in his wake. Finally, the sound then the rumble then the vibrations were gone, and our idyll was gone with it. The field, that moments before had been a shimmering sea of orange, green and yellow, was now a ruin of tire tracks, broken stems and mud. Worse, the tranquility on Corey’s face was also gone, replaced by a shadow of loss. It was as if in the same moment that she had been blessed with a vision of eternal life, she was cursed with knowledge of ultimate destruction, and the recognition that they were parts of the very same thing blew an enormous hole in her psyche. Corey and I had many more days of sunshine and adventures in nature the rest of the summer, but she was never really the same after that day. The shadow across her soul seemed to grow longer, even as the days grew imperceptibly shorter. Demi, Corey’s mom, lives out on a farm just beyond the glow of the city. For as long as anyone can remember, she has thrown a party every year in her huge barn on the weekend when the clocks change. She figures that the party enters into a twilight zone of sorts, and we gain a free hour of magic and revelry by having it on that day. That used to make more sense when we could stay up all night, but these days, the festivities have generally wound themselves out before midnight. Everyone in the entire county is invited, and it seems like everyone from the entire state comes. She’s got donkey rides, a huge bonfire and a pumpkin cannon that can shoot a pumpkin more than a quarter mile. Corey’s brother Donny always leads a string band in the loft and a dance caller leads all the kids to Fly Around My Pretty Little Miss, tumble Over the Waterfall, and get lost in a Devil’s Dream for hours on end. All of the food is grown on Demi’s and neighboring farms. There’s always a spit-roasted pig, corn on the cob drenched in butter churned on-site, potatoes of every kind, home-baked breads, more dishes made with apples than you could imagine, home-brewed beer and cider, and someone always has a jug of apple jack brandy that they cooked up for the occasion. No one goes hungry at Demi’s party. And no one is turned away. Unfortunately. One of the last to arrive at the party blew in on one of the loudest motorcycles I’ve ever heard. Geese flying south would veer off course when this thing is fully opened up, and he tore down the dirt road leading to the barn with complete disregard for life and limb. It was the ATV guy from last June. He had on the same gaudy flame-decorated helmet, and his tricked-out Vulcan bike had cheesy flames on its gas tank too. That didn’t stop a crowd from gathering around him to see who he was and what he was about. Corey stormed out of the barn when he drove up. She heard the roar of the engine, and instinctively knew who it was, and she was going to have none of it! Her anger parted the crowd around him and his bike, and she faced off with him demanding that he leave immediately. What started as a shadow back in June had grown into a full rage, and she unleashed it on the rider without holding back. He turned away from her and slowly walked toward the bonfire as if he had heard nothing she said. 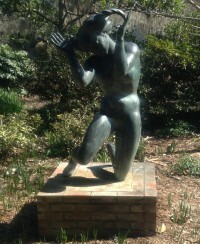 The crowd let him go, and turned their attention to Corey, who had spent her every last ounce of energy on her tirade. A few of her friends held her up and slowly walked her back to the barn. She seemed to be in good hands, so I went after the rider to find out who the hell he was, and to get him to leave. I saw him approach the fire pit, and walk around behind it while I was in pursuit. The bonfire was burning eight feet high, and it played tricks with my eyes. By the time I got there the flames seemed to have swallowed him up. He had dropped his helmet on the ground on the far side of the fire, but he was nowhere to be seen. I had never seen his face, and now without his helmet, he had melted away into anonymity in the crowd. I searched the entire grounds, but I didn’t really know who I was looking for. I just knew that for Corey’s sake and mine I needed him to be gone. I was in the loft with the dancers hoping for a flash of recognition, when I heard his motorcycle fire up again then fade into the distance as he rode off into the night. I was not the only one relieved to hear that sound. The entire room exhaled at once, and resumed their Soldier’s Joy. I climbed down the ladder to go find Corey and make sure she was ok, but she wasn’t there. No one saw her go, but many did see two people on that Vulcan as it sped down the road. And that was it. She was gone. All winter we searched for her, and we heard rumors of where they had been, but by the time we got there, they had already moved on. Demi knew someone who knew someone who knew the rider, and we tried to get a message to him, but they had gone deep underground, and no one could follow their trail. Months passed, and one by one Corey’s friends and family gave up on the search. They hadn’t given up on Corey, but they needed to get back to their lives. Winter itself was enough of a burden, they didn’t want to waste any more time on a fruitless search. Even I spent less and less time on it. Around the beginning of April, there were growing signs that winter had eased its grip and was not returning. The snow was all but gone, lingering only in the massive mountains left in the corners of mall parking lots. The crocuses were giving us hope that there was more to the world’s color palette than just black, white and gray. Her brother Donny decided that it was time to get some folks together for some wine, music and celebration despite Corey’s absence. In all honesty, it didn’t take much to get Donny to decide that wine was in order. He was well known as a drinker and carouser, but that seemed to be much of his charm. He had pushed all of the furniture in his modest living room to the walls to give more space for dancing. The thirty or so people who were there were not so much dancing as bobbing rhythmically as one unit to the ecstatic beats from the stereo. Every body was pressed against at least three others in a sweating mass of arms, torsos and legs. The layers upon layers of clothing that everyone had worn all winter were pared back to the minimum required by modesty, and everyone felt a sense of relief with the coming of spring. Soon, I realized that in the very center of the mass of dancers was Corey: dancing with her eyes closed, slowly absorbing the energy in the room. She may have been there all night, or she may have slipped in while no one was looking. She may have simply materialized out of the ether. However she did it, seeing her took my breath away. The look on her face in the middle of that dance was the same peaceful reverie that I had seen last June, and her flowing movement suggested that in her mind, she may as well have been alone with no one watching. She looked the same as the day she disappeared, but for the pomegranate-red lipstick she was wearing. I hated to interrupt that moment, but I had to. I had to get her away from the crowd and talk to her. I was so relieved to see her, and thrilled that she was now safe. As one song ended, I pressed my way to the center of the crowd and gently took Corey’s hand. She opened her eyes and a smile grew slowly across her face until the smile lit up the whole room. She was back. Still holding my hand, still smiling, she led me out of the house into Donny’s back yard where it was quiet and we could talk. She did not speak, just continued to smile with an aura of eternal patience and love. We spent all that spring together—getting reacquainted, spending time with friends and family, and planting a garden of wildflowers. Not once did I ever broach her forbidden subjects, but I did tell her about all I had done to try to find her while she was gone. I reveled in the warmth of her smile. By late-June, the wildflowers had taken over the garden, and bumblebees, hummingbirds and butterflies made their daily visits. Even some Devil’s Paintbrush had found its way into our little sanctuary. I was sprawled out on a blanket on the lawn enjoying the midsummer sun. Corey was busy weeding the garden—though how she could tell the difference between the weeds and non-weeds was still beyond me—humming and singing to herself in a dream. Then we heard it. A motorcycle far in the distance, but getting closer and closer. We couldn’t see the road, so we couldn’t see the bike or rider as it sped past and grew quieter again. But I knew. I looked at the shadow that had fallen across Corey’s face. She knew too.